Thank you for visiting World Global Express. This site originated from a vision in 1985 that I thought was only a dream. I was awakened from my sleep by a beautiful serene loving Presence that was soon to be made known to me. The gentle Voice spoke softly as the vision appeared. I saw myself standing in space next to this beautiful Heavenly Presence. We were looking at our blue Planet Earth. It was in great turmoil. The gentle Presence was masculine. He extended his right hand forward with palm upward towards our World. A beautiful book suspended in space, opened over the top of the Earth, and wondrous rays of pulsating white Light emanated from the pages. Like lightning, the Light shot to the right and circled the Earth, illuminating it and rays of Light emanated all around our Globe. The beautiful Presence then spoke gentle encouraging words and as he spoke the words formed in large letters under the Earth. The words were: "(T)His Light must cover the Earth." Then the words "WORLD GLOBAL EXPRESS" formed around the top of Mother Earth as you see in the logo. It took me a little time to figure out what needed to be done, but I was instructed with more visions and dream-visions. The Presence in the vision, I felt was the Son of God. (Notice the word(s) "(T)His." The instructions were given that I must write a book and then "extrapolate" some of the messages to be put into the computer and eventually on the Internet. As you can surmise, it took me 15 years to get to this point. I wanted to be sure I was actually talking to my Guardian Angel and other Angels as well as getting information from Jesus and Mary and the "Hosts of Heaven". I am co-creating Heaven on Earth. A little booklet, WGE wasn't reaching enough people, so I had to expand. 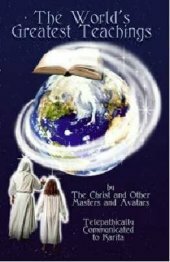 My book called "THE WORLD'S GREATEST TEACHINGS", by The Christ, book one is almost completed. *(Published June 2002). We will attempt to give you Truth, in Peace, Light of God and Love; but you yourselves must find your own Truth which is within you. The purpose of this site is to help you to realize who you truly are in this world, and to let your beautiful love light shine brightly for all the world to see. We are all children of God made in his image and likeness, experiencing Life. We are all equal. We are Divine Spirits experiencing flesh on the Earth Plane. The flesh will eventually turn to dust, but the Holy Spirit of you will always live. Read other pages herein if you are so inclined and also read "Words With Wings" which we will link to WGE. God loves you and I love you and bless you with all that I AM. Be at peace for Peace is the word and Love is the Vibration.